Antwerp, Plantin, 1593. 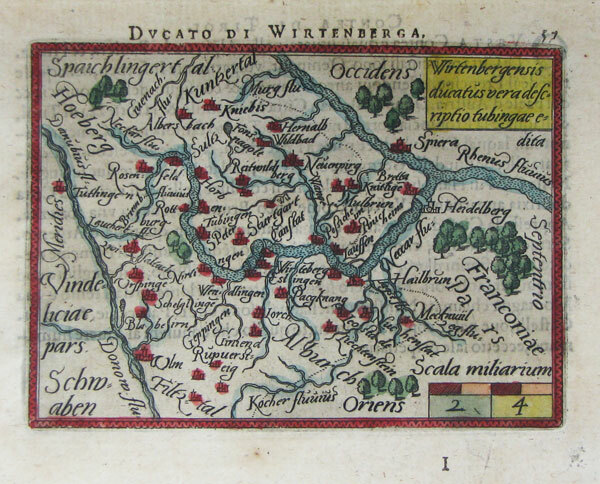 Minature map of Wurttemburg, engraved by Philip Galler for Ortelius's Epitome, this example for an Italian-text edition, translated by Giovanni Paulet. Antwerp, Plantin, 1593. 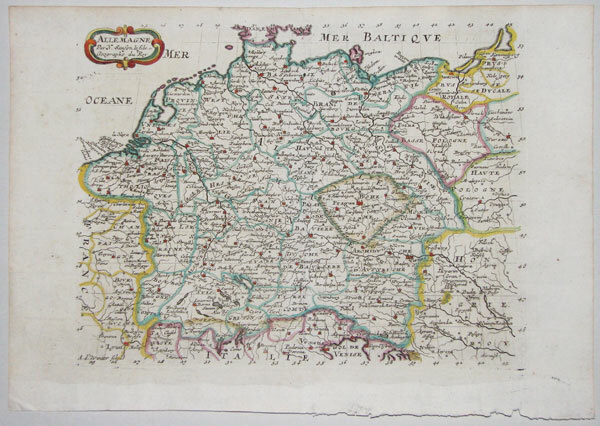 Minature map of Brandenburg, centred on Berlin, engraved by Philip Galler for Ortelius's Epitome, this example for an Italian-text edition, translated by Giovanni Paulet. Antwerp, Plantin, 1593. 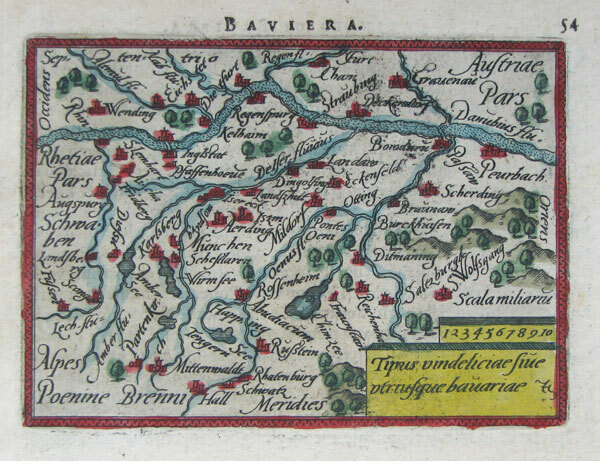 Minature map of Bavaria, engraved by Philip Galler for Ortelius's Epitome, this example for an Italian-text edition, translated by Giovanni Paulet. Antwerp, Plantin, 1593. 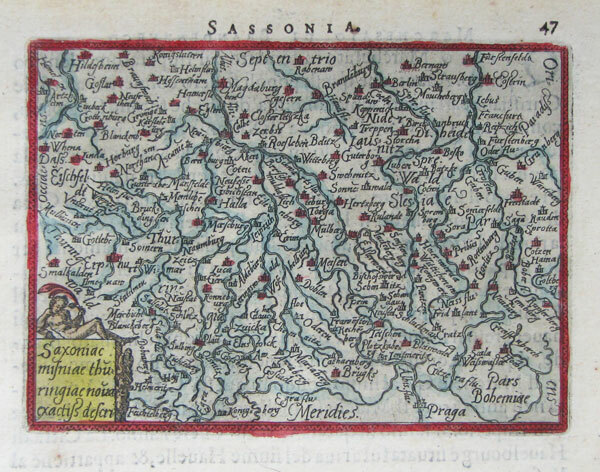 Minature map of Saxony, engraved by Philip Galler for Ortelius's Epitome, this example for an Italian-text edition, translated by Giovanni Paulet. Antwerp, Plantin, 1593. 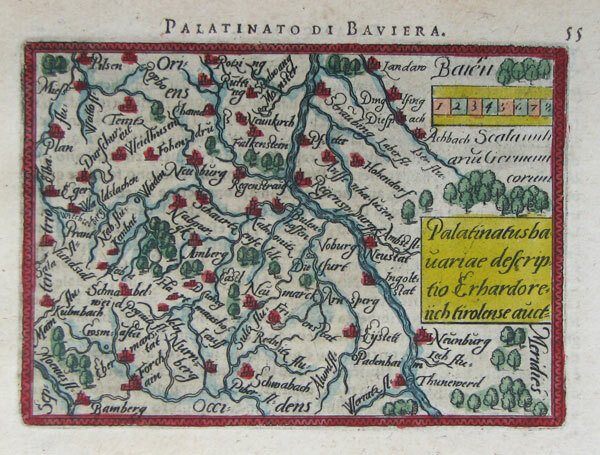 Minature map of Ditmarschen, engraved by Philip Galler for Ortelius's Epitome, this example for an Italian-text edition, translated by Giovanni Paulet. Antwerp, Plantin, 1593. 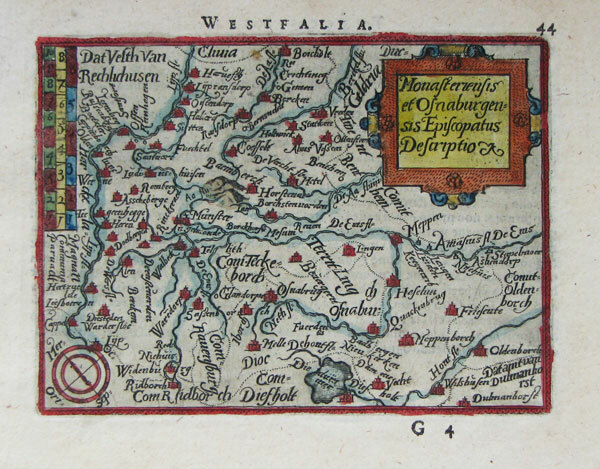 Minature map of Westphalia, engraved by Philip Galler for Ortelius's Epitome, this example for an Italian-text edition, translated by Giovanni Paulet. Amsterdam, c.1618. 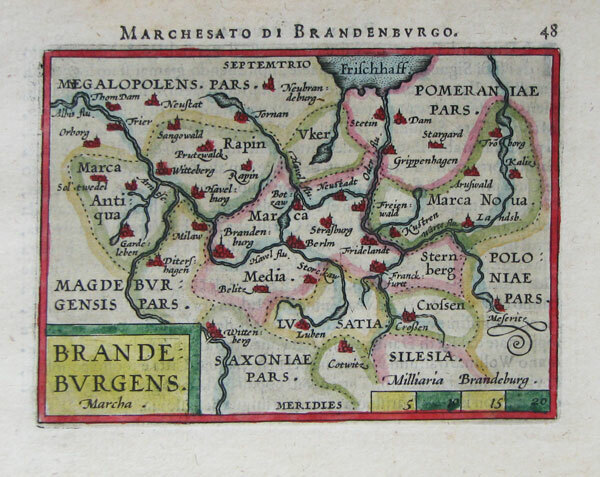 A miniature map of Brandenburg. Basle, Henry Petri,1628, German text edition. 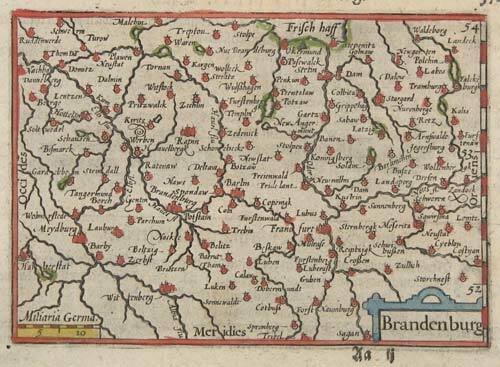 A map of Franconia, one of the five stem duchies of medieval Germany. 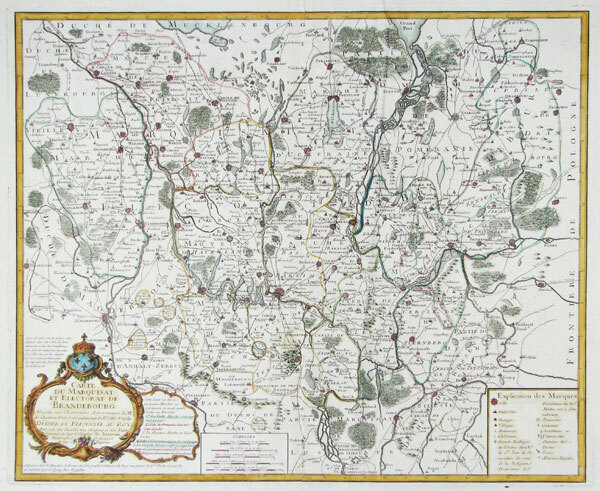 Orientated with north at the bottom, the map follows the Main River and marks the cities of Nurnburg, Bamberg, Coburg and Wurzburg. Basle, Henry Petri,1628, German text edition. A map of Swabia, one of the ten Imperial Circles of the Holy Roman Empire. Orientated with north at the bottom, it marks Strassburg, Bamberg and Lake Constance. Basle, Henry Petri,1628, German text edition. 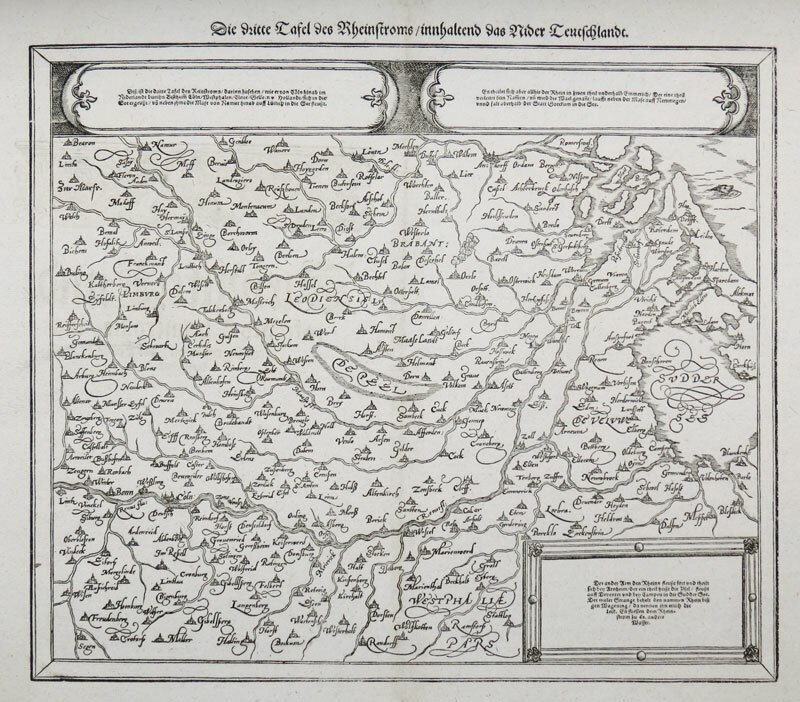 A map of the Rhine from Bonn and Cologne to the Sea, orientated with North to t he right. Amsterdam, 1635. 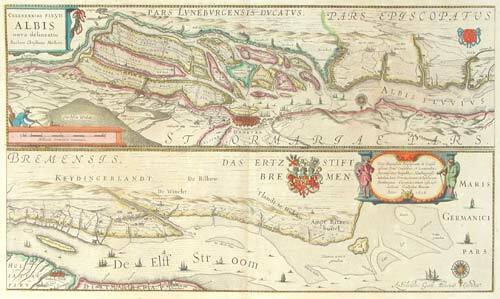 Map of the Elbe River, orientated with north to the bottom, marking Hamburg. Paris, 1683. 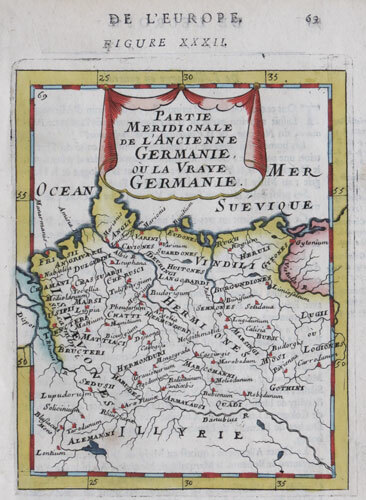 Map of ancient Germany, marking the tribes, published in Mallet's 'Description de l'Univers'. Paris, 1683. 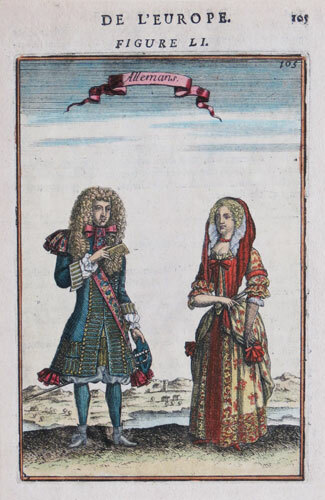 The attire of the German upper class, published in Mallet's 'Description de l'Univers'. 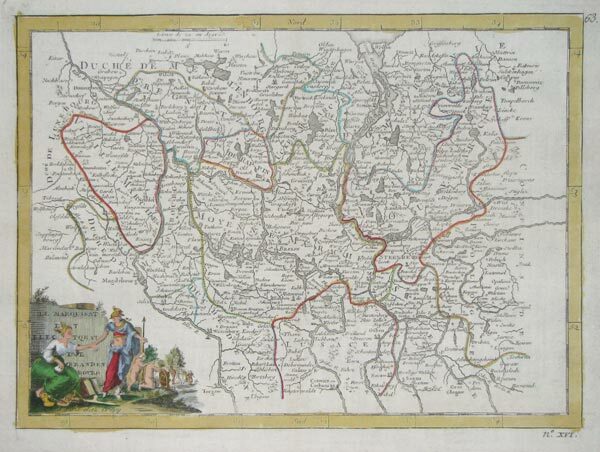 Rome, 1687. 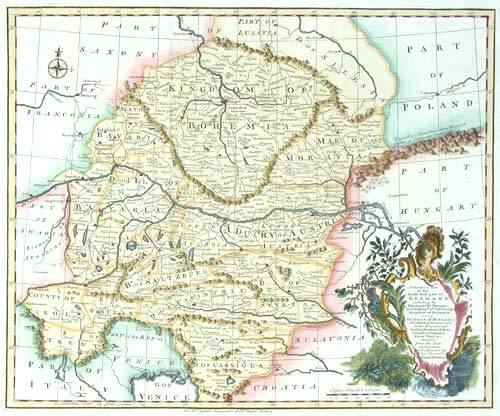 Cantelli di Vignola's map of north-east Germany including Berlin and what is now western Poland. Paris, c.1692. 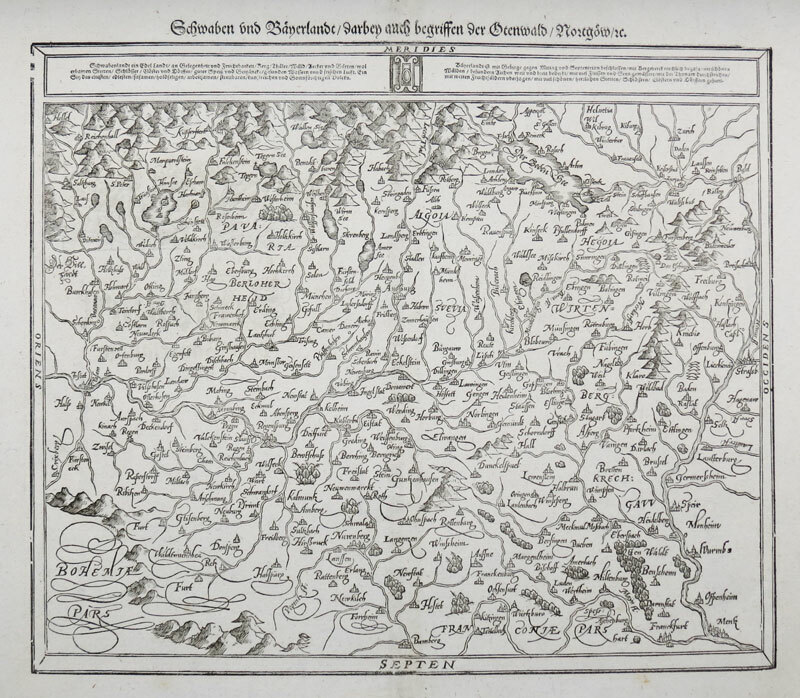 Germany, engraved by A. de Winter for the quarto edition of Sanson's atlas. London, c.1745. Bavaria, but also Including Bohemia, Moravia and Austria. Published for 'Mr Tyndal's Continuation of Mr Rapin's History' [of England], with a decorative title cartouche. London, c.1860. 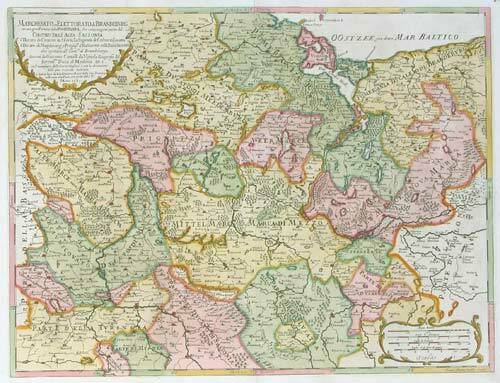 Detailed map, published just prior to the unification of Germany under Prussian dominance. 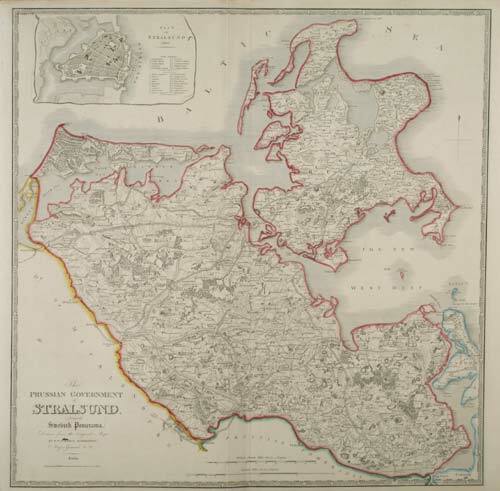 With an inset of Stralsund city. Paris, 1757. 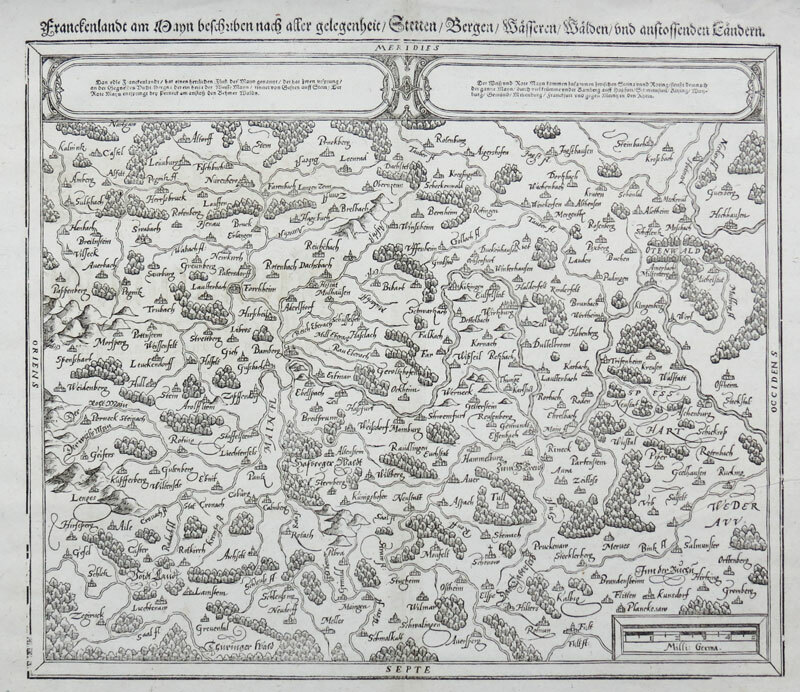 Brandenburg, with Berlin at the centre, also marking Potsdam and Stettin (now Szczecin in Poland).